Islam is one of the most influential and widely practised religions in the world and there is a growing recognition that Islamic Studies is a subject of strategic importance both in the global context and in modern Britain. This Islamic Studies degree offers you teaching of the highest standard, in a research-intensive environment where scholars and students come together to explore the rich and variegated landscape of Islam, the Islamicate, Muslim societies and cultures. We combine a number of academic perspectives throughout the degree, including theology, history, philosophy, sociology and political science. The complex and evolving nature of our field of enquiry demands dynamic tools of analysis, meaning that you'll study the conventional analytical tools applied in Islamic Studies alongside cutting-edge approaches such as decoloniality and critical Muslim studies. You'll also be able to access a wide range of activities offered by the School's Iqbal Centre for the Study of Contemporary Islam. Year 1 can be studied part-time over two years through the Lifelong Learning Centre. The remaining years will be completed full-time through the School. Our departmental archive contains 500 Arabic manuscripts, as well as 10,000 archaeological artefacts that range from Pharaonic to early Palestinian eras. It’s a fantastic research resource – as is our University Library, which has extensive collections relating to Middle Eastern politics and cultures as well as Islamic studies. The University Library runs free classes and workshops so you can learn how to use them. If you choose to study Arabic or another Middle Eastern language during your degree, you’ll have access to the University's Language Zone with digital language labs, audio-visual booths and Computer Assisted Language Learning (CALL). There’s also our Electronic Resource Information Centre, which features specialised computing facilities for translation studies and Interpreter Training Suites to help you explore your career options. This degree comprises all the traditional subjects you would expect of a firmly-grounded and well-designed Islamic Studies degree. You'll cover modules which deal with Muslim theology, Shari’a law, Islamism, Qur’anic Studies and contemporary intellectual trends. You'll also have the opportunity to explore intellectual traditions, social formations and political discourses that are too often marginalised or excluded altogether from the discipline. Examples include Sunni-Murji’ite theology, proto-Shi’i theology, Hanafi legal thought, sexual ethics, emancipatory readings of the Qur’an by women and Black Muslim liberation theology. Throughout your degree, you'll benefit from ample opportunities to explore your own intellectual curiosities, especially from your second year onwards, when you will be able to formulate your own essay questions within certain modules. In your final year, you''ll be able to put the research skills you have gained into practice in your final year project – an independent piece of research on a topic of your own choosing. You’ll benefit from a variety of teaching and learning styles at Leeds. Our tutors are experts in their fields, and they usually pass on their knowledge through a combination of lectures, small-group seminars and tutorials where you will be able to discuss key issues across your studies. There is also more emphasis on independent learning, meaning you will spend time building your research skills and thinking critically about the information you find. We also use various types of assessment. Exams and essays are a significant part of this, but in some modules will include group work, reports, or presentations. We offer support in these areas as well – for example, we run extra classes on skills such as public speaking, structuring essays and exam technique that you’ll be able to attend throughout your time at Leeds. Where an applicant is taking the EPQ in a relevant subject this might be considered alongside other Level 3 qualifications and may attract an alternative offer in addition to the standard offer. If you are taking A Levels, this would be BBB at A Level and grade A in the EPQ. Pass diploma with 60 credits overall, including at least 45 credits at level 3, of which 30 credits must be at Distinction and 15 credits at Merit or higher. An interview and a piece of written work may also be required. BTEC Level 3 National Extended Diploma: DDM. Other BTEC qualifications are also considered. Please contact the Admissions Office for more information. 34 points overall including 16 at Higher Level. BB in Advanced Highers and AABBB in Highers, or B in Advanced Highers and AAABB in Highers, or AABBBB in Highers. Typical Access to Leeds offer: BBC at A Level and pass Access to Leeds. We accept a wide range of international equivalent qualifications. For more information contact the School of Languages, Cultures and Societies admissions team. An Islamic Studies degree equips you with a wide range of skills for a variety of careers, as well as deep theological, linguistic and cultural understanding of one of the world’s most influential faith traditions and a region of global significance. Your knowledge and skills gained through the degree could lead to careers in the Civil Service; FCO; local government; law; Islamic banking and finance; media (television, radio, online and print); education; non-governmental organisations; and business and commerce. Increasingly, graduates with specialist knowledge of Islam, Muslim communities, Islamic law, theology and contemporary trends in Islamic thought are being sought by policy institutes and think-tanks, international development organisations and the Ministry of Defence. 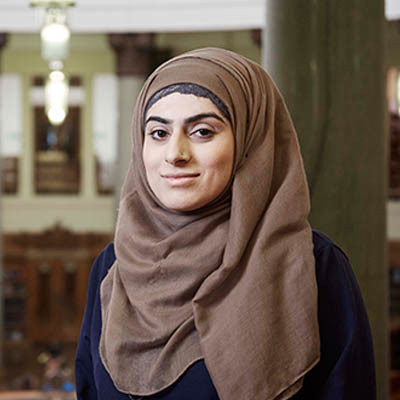 Postgraduate study at Leeds or at another university allows for further specialisation in Islamic and Middle Eastern Studies, which can lead to PhD study and a career in academia.